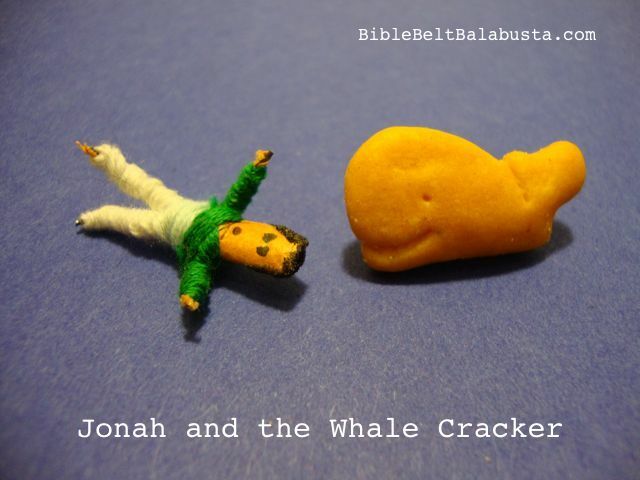 I made this for a Purim tot program a few years ago. A giant hamantasch is the target, the middle of which is lined with velcro strips: the “hook” side. 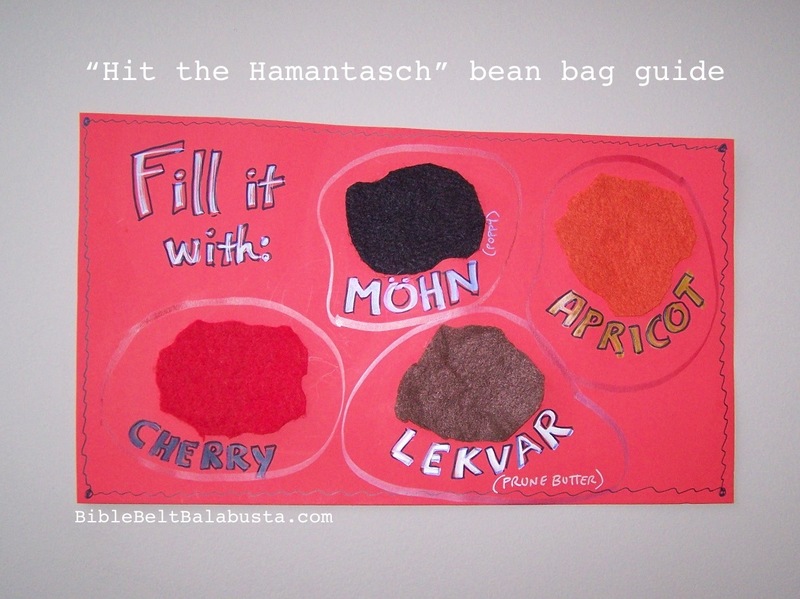 The projectiles are blobby felt bean bags in colors that represent traditional hamantaschen filling: black for mohn (poppyseed), brown for lekvar (prune butter, YUM), red for cherry, orange for apricot. The felt bean bag surface will stick to the prickly velcro, no prob. 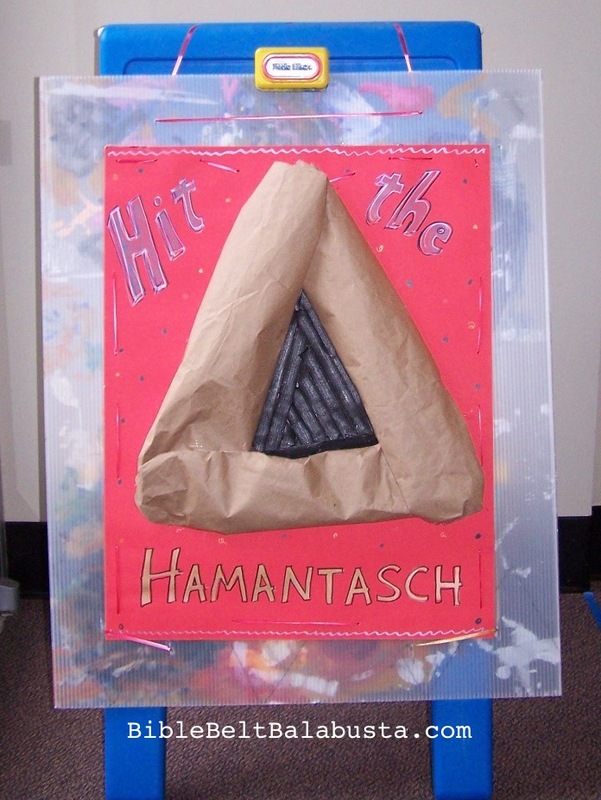 I had to mount my fake hamantasch onto corrugated board (S-core board) and then tie that onto an old Little Tikes easel. No way could I mount it on the wall and make it actually stay there. The easel absorbed the projectile shocks from all throwers just fine. A helper staffed the station and handed out bean bags, which meant he could use the vocabulary in a natural way, and kids would hear it. He asked which filling they wanted, and then named them. 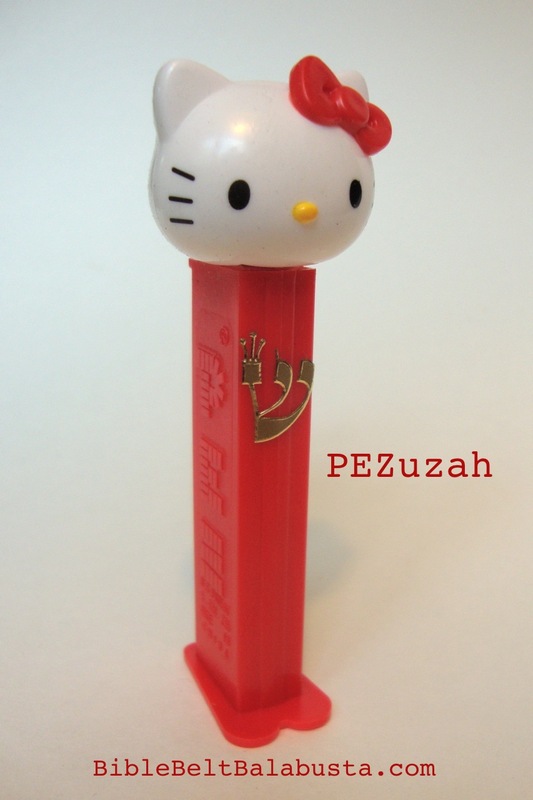 How many times a year is a 5 year-old going to hear the word “lekvar?” Maybe you live near Zabar’s where you can buy lekvar in a freakin’ tub, but most people don’t bump into lekvar in the course of a day’s shopping. It’s special, it’s fun to say, and it’s so very, very tasty: lekvar. Construction Tips: I used brown (kraft) wrapping paper to make the giant hamantasch, but paper is not going to last very long. Ideally, I would make the three-corned pastry from a beige/tan felt. I tried using pantyhose, but oh my gosh what a pain to work with and frankly, they looked slightly obscene. That, and they “ran.” If you want to go with pantyhose for the tactile factor, buy tights or grandma-strength support hose. I hot-glued the velcro strips to the middle of the cookie. Make sure you use the “hook” surface of velcro, not the loop surface, or the bean bags will slide right off. Bags: Tutorials for making bean bags abound online. I just used cheap felt sheets from Michael’s Craft Store. For the innards, I chose unpopped popcorn kernels and then hot glued the edges together. Sewn edges on felt can get pulled out by the velcro hook surface, and then everyone is skating on popcorn kernels. I just realized I didn’t take a picture of the actual bean bags, but they are about the size of a a small hamburger. I didn’t want them too big or the kids would have trouble slinging them. Make a Lane: As with all throwing games, I make a lane to delineate the space. Without a marked lane, the game loses a lot of appeal. With a lane, people (even toddlers) can know where to go, where to stand, where to throw. And other folks don’t block a marked lane with chairs and strollers by mistake. 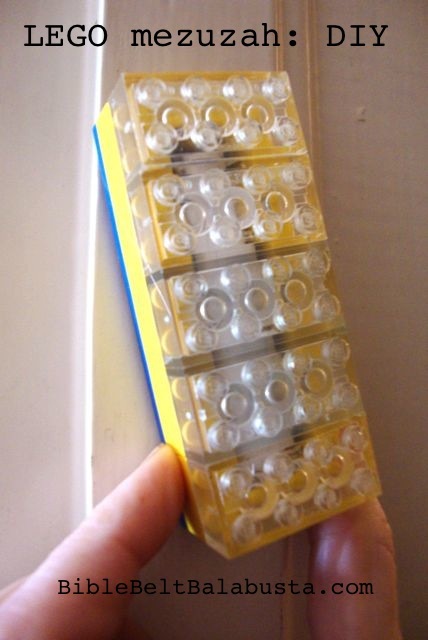 Use blue painter’s tape to outline the space. It comes off of carpet and hard-surface flooring instantly. The best place for a throwing lane is in a corner, so that one wall shares the length of the lane, and one wall is immediately behind the target. This will guarantee fewer errant bean bags to chase down and fewer injuries. Not as many kids will get accidentally “beaned” (ha) if half the throwing area hugs a wall. Oh, and hamantasch is singular, hamentaschen is plural. Some folks don’t know this, some folks don’t care. I don’t always use the correct term, but I like to know which is the correct term. 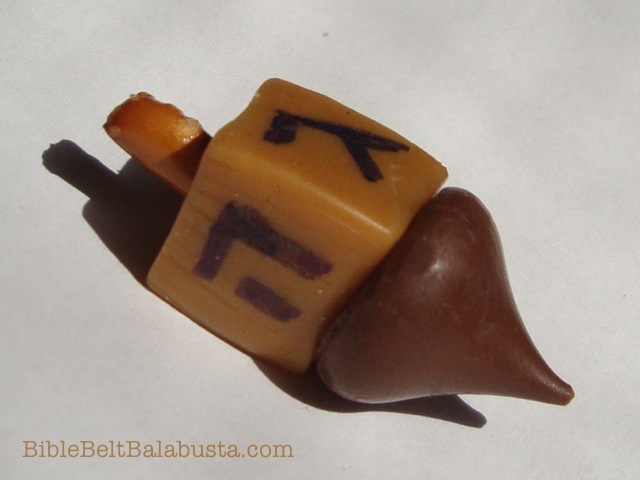 Either way, hamantaschen are fun to hit. 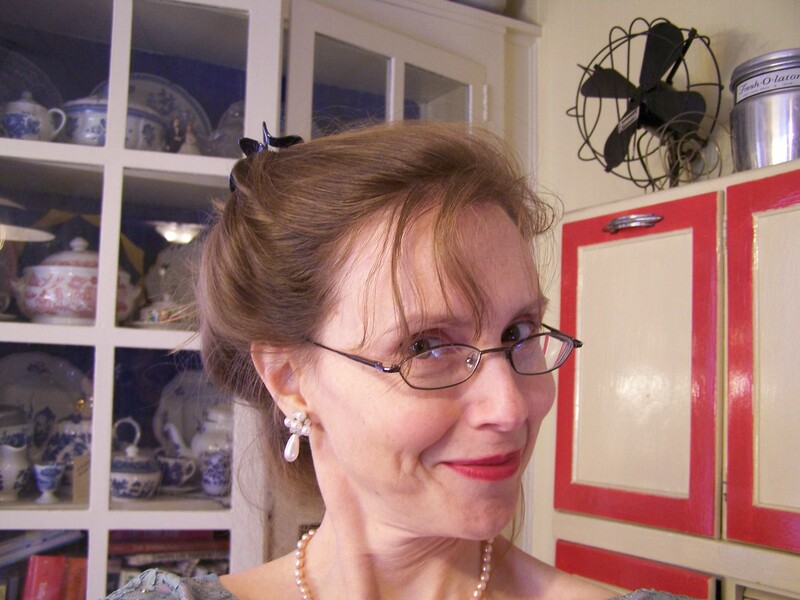 This entry was posted in Activity, Purim and tagged bean bag, game. Bookmark the permalink. 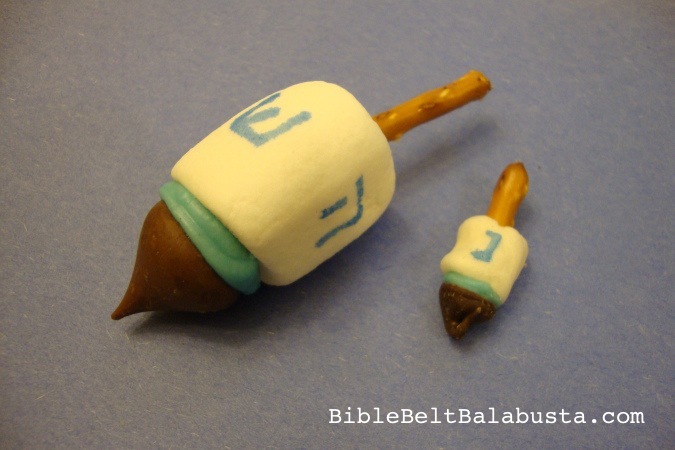 I showed this to teachers from our religion school, they loved it and made one up for their Purim activity day last weekend. I didn’t get to see it in action, but they told me afterwards that the kids loved it! Thanks so much! Ooooh would I love to see a pic of that. Wonder what they used for the cookie part? Thanks for letting me know.